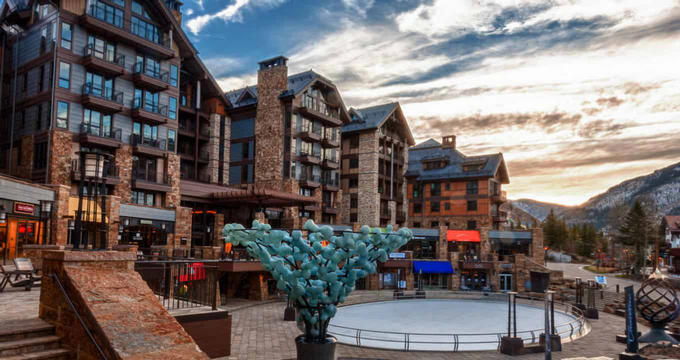 The Solaris Residences in Vail, Colorado provide high-end, top of the line lodging and home suites. Solaris Residences has utilized Colorado’s natural beauty by constructing a cozy lodging experience for all who wish to experience the luxuries of both the indoor and outdoor world. 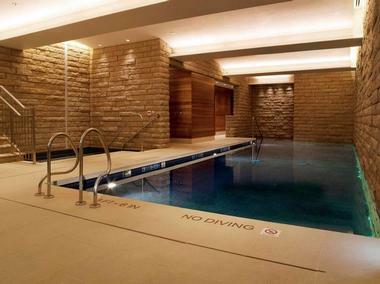 At Solaris Residences in Vail, Colorado, guests have the option of staying in one of the limited, private home suits. Suits are available with 1-4 bedrooms, and include state of the art, modern amenities. They are also spacious with bedrooms and separate living and dining areas. The home suites availability is limited. Home suits are available with either a valley view or mountain view. The one bedroom + den home suite accommodates up to four people. The first bedroom has a king-size bed. A den holds two twin-size beds. The master suites include a soaking, jet sub and a shower. Both bedrooms have their own bathrooms and flat screen televisions. This home suite is 1,400sf. The two bedrooms home suite accommodates up to four people. The first bedroom has a king-size bed and the second bedroom has two twin-size beds. This suite has a total of 2.5 baths and the dining area seats six. There are also extra barstools available for seating in the dining area. The master bedroom has a soaking, jet, and shower. There is a separate living space for guests to relax in and a powder room. This home suite is 1,180sf. The two bedrooms + den home suite accommodates up to six people. The first bedroom has a king-size bed and the second bedroom has two queen-size beds. Bed size in the den can vary. The master bedroom also has a soaking, jet, and shower. The second bedroom has its own bathroom. This type of home suite is 1,700sf and includes a spacious kitchen. The three bedrooms home suite accommodates up to eight people. The first bedroom has a king-size bed. The second bedroom has a king-size or queen-size bed. The third bedroom has two twin-size beds or two full-size beds. All bedrooms have their own private bathrooms. The master suite includes a soaking, jet tub and separate shower. There are many windows throughout the suite that let in lots of natural light and mountain air. This home suite is approximately 2,300sf - 2,600sf. 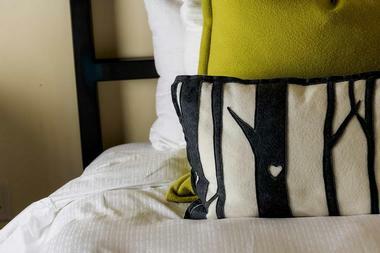 The three bedrooms + den home suite accommodates up to eight people. The first bedroom has a king-size bed. The second bedroom also has a king-size bed. The third bedroom has one queen-size bed or two twin-size beds. Additionally, the den has a large queen-size sofa sleeper. Each bedroom has its own private bathroom. There is ample seating available in the kitchen. There is also a separate powder room. This home suite is approximately 2,270sf. The four bedrooms suite accommodates up to eight people. The first, second and third bedrooms all have a king-size bed. In the fourth bedroom there are two queen-size beds. All bedrooms have their own private bathroom. This suite includes a cozy stone fireplace. This home suite is 2,880sf. The four bedrooms + den home suite accommodates up to ten people. The first and second bedrooms have a king-size bed. The third bedroom has two twin-size beds and the fourth bedroom has two full-size bed. Additionally, the den has a queen-size sofa sleeper. Each bedroom has its own private bathroom. There is ample seating available in the kitchen. This home suite is approximately 2,880sf. -personal assistants available 9 a.m.- 9 p.m.
At the Solaris Plaza, there are many dining options available to guests. For an entertaining dining experience, patrons can visit bol. Bol a contemporary bowling venue that offers fun for families of all sizes and ages. 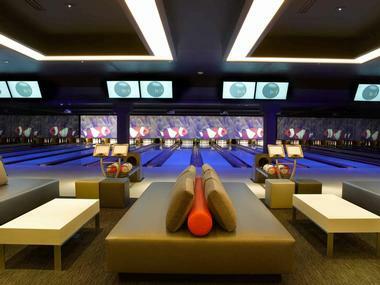 The ten lanes of bowling are open to locals and guests alike, and is the only bowling venue in Vail, Colorado. Bol also offers a sixty-foot bar, a wide variety of menu items, an assortment of wine options and a chill, stress-free environment. Another dining option located at the Solaris Plaza is home to world-class and world renown celebrity Chef Nobu Matsuhisa’s. His delectable sushi items arrive to the Solaris Plaza inspired by his chef training in Tokyo, Japan, as well as his culinary experiences in Peru and Argentina. The design of the Solaris Plaza includes modern, sleek architecture, stone fireplace, outdoor fire pits, and large windows that let the guests marvel at the mountainous region all around them. Guests can also choose to order sushi to be delivered to their rooms. Solaris Residences offer spa services as well as an on-site 24-hour fitness center available to all guests. The Fitness Center includes a variety of cardio machines and free weights. Guests looking to continue their day of relaxation and recuperation can take a dip in the indoor, heated pool and hot tub.